Waterborn ready with temperature modulation. Exhaust filtration with EU2 (99%) Dry filtration. Set and forget controls which are automatically set ofr an optimal painting environment. Truflow’s control unit for Mach I Full Downdraught Spray Booth incorporates simple display for operator confidence. 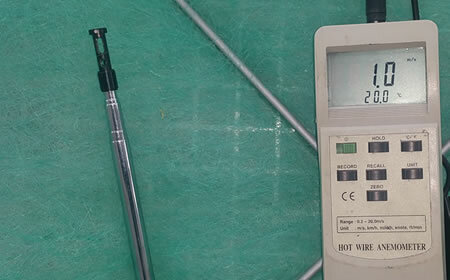 The temperature controller includes fully automatic spray and baking modes with flash off timer and for a consistent spray temperature the system is designed with a modulating control unit ensuring temperature accuracy to +/- 1.C. The stainless steel direct fired burner ensures fast drying times and extremely fast ramp up times. Standard system function and process including, purging, cycle, bake time and fault light indication. 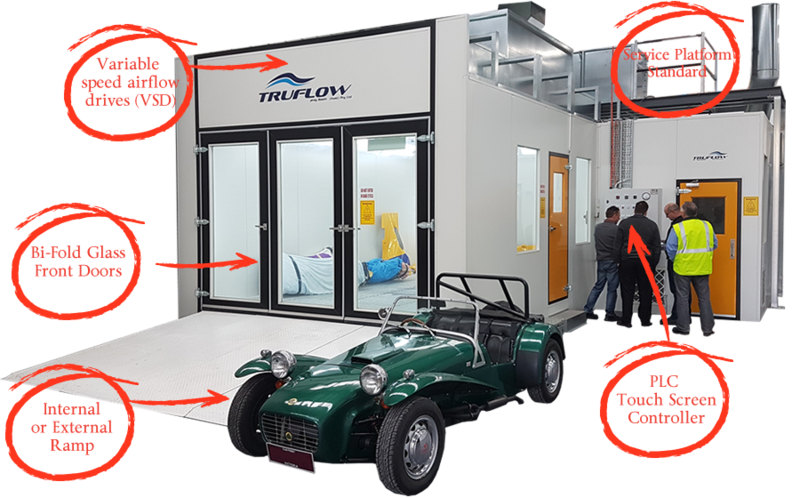 The TRUFLOW Range is designed to last the test of time and can be adjusted to suit your site conditions or layout. With Insulated 50mm interlocking wall panels in a white colour bond finish and Engineered roof structure with sheet metal folded and pressed interlocking panels for a bolt together modular fit the Elite Series can be installed quickly and professionally. Glass doors are standard and machinery position and location can be suited to the space available in your workshop. 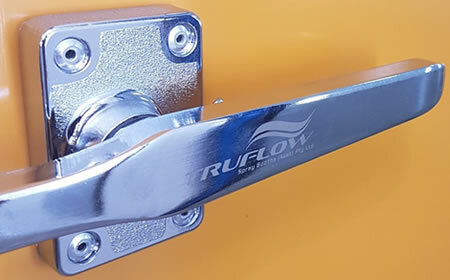 The collection of small details are what makes a TRUFLOW product great. 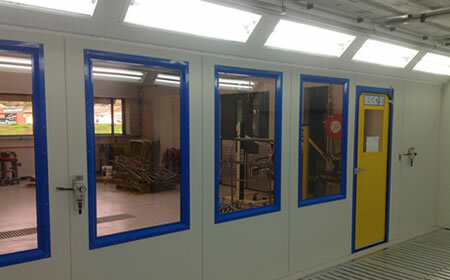 The feeling of quality on every part and panel of the spray booth is part of the experience. From the handels to the hinges to the heat insulation around the burner. We pay attention to detail so your product will ensure the rigours of high volume painting. 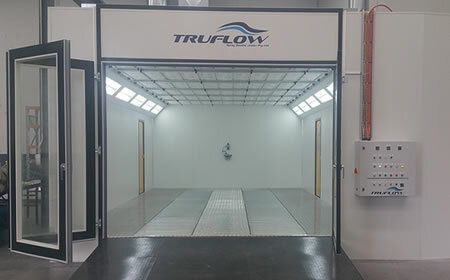 We know this is a big claim and thats why we back every spray booth with a standard 1 year warranty and extended 5 year warranty with a TRUFLOW Service maintenance program. The Centrifugal supply fan combined with a turbo axial exhaust and Direct Fired GAS heating provides accurate and reliable airflow within the cabin during spray and bake cycles. The Elite Series Mach I is an excellent performer and very economical run with the use of modulating GAS which automatically controls and maintains temperature to a accuracy of +/- 1 .C on curing cycles. Internal Air Drive Ramp / or external to suit workshop layout. Airflow Jets avaible on request. Just because its a computer doesn’t mean it has to be complicated. 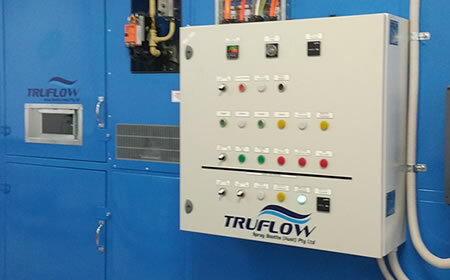 What TRUFLOW has managed to do is design a one touch control panel that provides simple operation with a large range of productivity features and function. 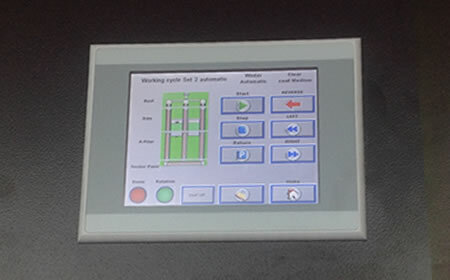 These features give you greater control over your spray booths operation and environment. The Mach II offers users different baking programs, electronic airflow adjustment, cabin pressure management and filter condition monitoring to ensure your booth is operating at its optimum performance level at all times. 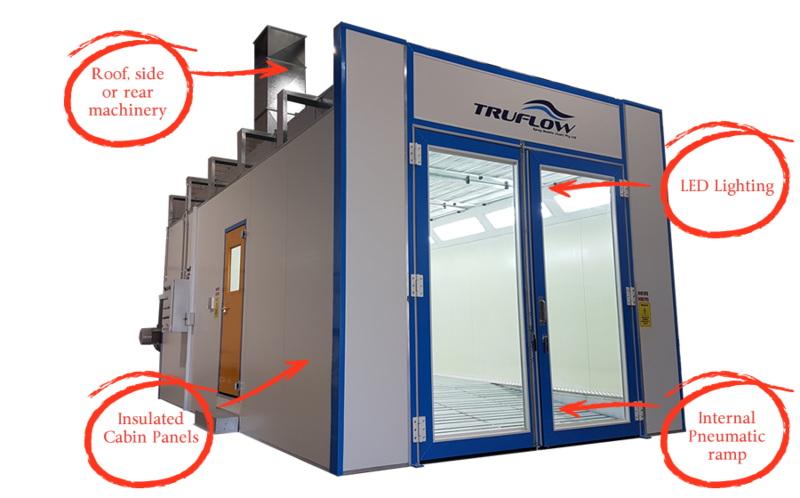 Both the Elite Mach I and Mach II of the TRUFLOW Spray Booth range is designed to last the test of time and can be adjusted to suit your site conditions or layout. 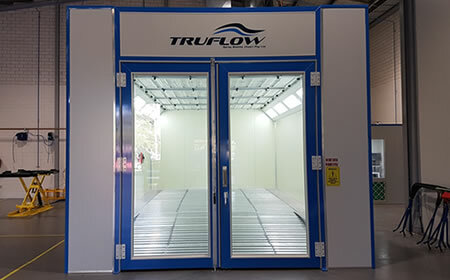 All TRUFLOW Spraybooths are built to a standard not a price, the Elite Series represents the best value for money available on the market today. The Elite Mach II is equipped with energy recovery systems including re-circulation on bake cycle to increase airflow, temperature ramp and flash off times while decreasing running costs. 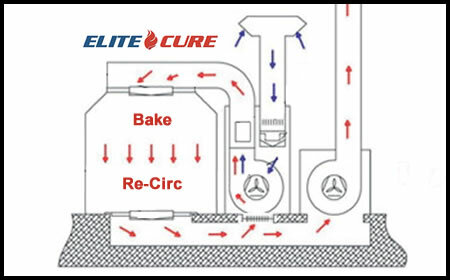 With energy recovery on bake cycle up to 80% of the air can be recuperated and introduced in front of the burner to re-heat the air that has already once passed through the spray booth cabin. This system minimizes energy loss through the stacks ensuring that only 20% of the energy generated is lost through the exhaust dilution. The Elite Mach II has Bi-Fold glass doors are standard with a 3500mm opening for optimal turn in. The cabin structure can also be fitted with large structural viewing windows to create an open feeling to your workshop while providing operator safety. Of course like the entire range when cabin changes are made the machinery positions can be adjusted and location can be suited to the space available in your workshop.